Hexenbesen ice fall: The Hexenbesen ice fall, also called “Shark”, is an extremely difficulty and narrow ice fall with mixed climbing in the rear of Pitztal valley. Notwegfall ice fall: The Notwegfall ice fall is also located in the read of the Pitztal valley. There are three high alpine, but beautiful ice climbing routes which are definitely worth a day trip! 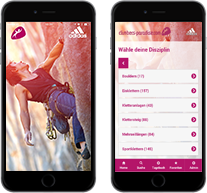 Taschachschlucht ice climbing garden: The Taschachschlucht ice climbing garden offers several easy routes which are also suitable for beginners. There are also mixed routes which are secured with bolts. Havanna-Route ice fall: The Havanna-Route ice fall close to Neurur is a true natural spectacle. It is a 35m high, free standing ice column. Climbing this ice fall is very hard and only for well trained and experienced ice climbers.